Octave Electronics CAT ad from page 15 of Contemporary Keyboard Magazine May 1977. This is the third CAT ad to appear in the magazine and Octave Electronics continued to showcase the distinctive artwork of J. Mannix. 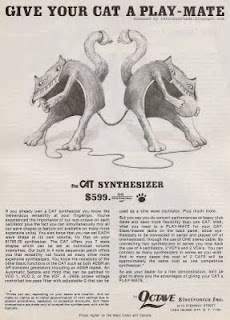 The first ad introduced the CAT in an illustrated 'jungle' setting to try and distinguish it from other synthesizers with its low cost and features. The second ad featured the CAT in a 'back lane' setting, but didn't really include any new information for readers. This third ad, featuring two CATs connected by a ball of yarn, finally gave readers a bit more information about its unique 'slave/master' jacks - aka its CV and Gate connectors. "The earliest version of CAT had no CV and Gate sockets at all. Later examples of the same model had two sockets marked 'To Slave' and 'From Master'. These were stereo quarter-inch jacks that carried the CV on the tip and the Gate voltage on the ring. If this wasn't strange enough, the Gate voltage was a non-standard 7.5V, which led to unreliable envelope triggering when used with conventional synths. It was only on later SRMs that Octave got its act together, although the synth retained the stereo jack arrangement rather than offering four individual sockets for the CV and Gate inputs and outputs." SOS indicates that early CATs had no CV and Gate sockets and although this ability is not mentioned in the CAT's Spec Sheet announcement in the November/December 1976 issue of CK, the earliest CAT ad from February 1977 does mention this ability. I can't imagine too many CATs are out there without sockets.